Nothing makes me as happy as giving a homemade card. I get to be creative while adding all the little things I know the person loves and adores in one package. I recently made a birthday card for my friend's husband. 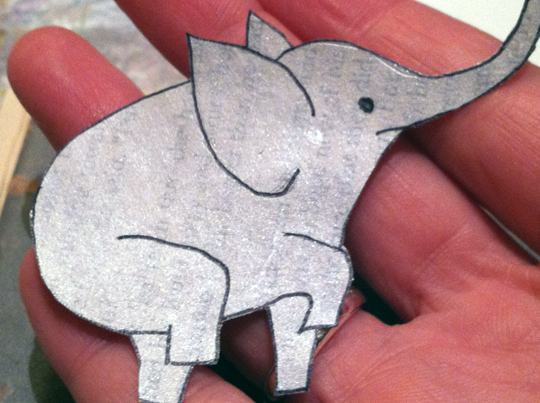 He loves elephants, so I found a cute version online (Thanks, Indie Craft Parade). 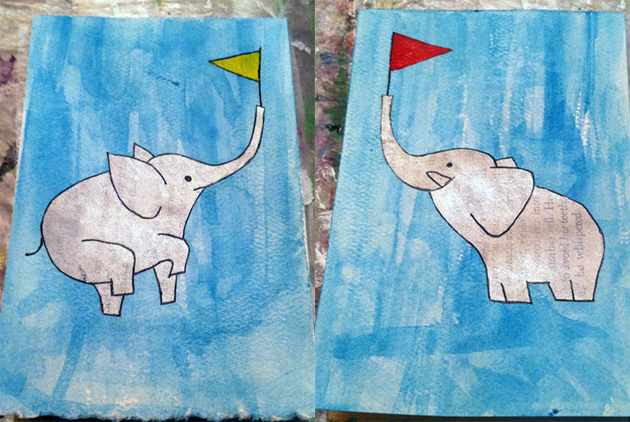 I started with an old book page, painted it in the color of my choosing, then traced off the elephant with a Sharpie. Next, I cut it out. One of my favorite products is Strathmore's Creative Cards. You can draw, stamp, paint, etc on them. They are the equivalent to blank cards, but for artists. I used the fluorescent white with a deckle edge. After I painted the background, I applied the cut-out elephant with glue and added in the finishing touches - like the tail and white tusk. I placed an elephant on both sides and filled the inside with quotes that reminded me of him. Then, I gifted the same family with a Valentine's Day package. I used one of the Strathmore envelops (as mentioned above), traced off a quirky heart and colored it in with Prismacolor colored pencils. I blended them with an alcohol blender pen, creating an almost velvety texture. I painted an old book page with white/silver paint and black ink. I applied part of the page to the flap of the envelop. Then, I tore strips of the page to make stripes going behind the heart. (The same stripes appear on the opposite side under the flap when closed). 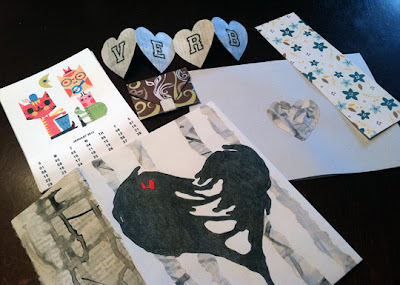 A bookmark, a set of 12 card stock calendar cards, a fold-out heart that reads verb on one side/love on the other (because love is a verb), a tiny envelop made from a heart and filled with hearts, and a personal message written inside of homemade card. The best part...I left it in their mailbox when visiting one evening. A little surprise in the mail always brightens a person's day. I placed my daughter's heart inside of a Valentine's Day card and my mom's heart was included in a homemade envelop with a necklace. 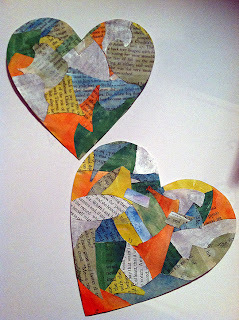 I started out by gifting my mail art buddies Christmas cards for the holidays. I hope I can continue to make these cards for my family and friends this year. They bring so much joy! Until next time - Remember love is a verb! It requires your attention and actions to keep it alive!